Allows to create link between applications that are in the same project, the link option incorporates various functionalities like above. To create a new link you just need to access the option Link between Applications located in the menu at the left side. When clicking in New Link the screen to choose the type of link that will be created will be displayed. Allows to edit registers of the grid using a form. Allows to create a link specifically to the filter’s fields, capturing data from other grid. Allows to create a link represented through a link, from a grid’s column to any application from the project. 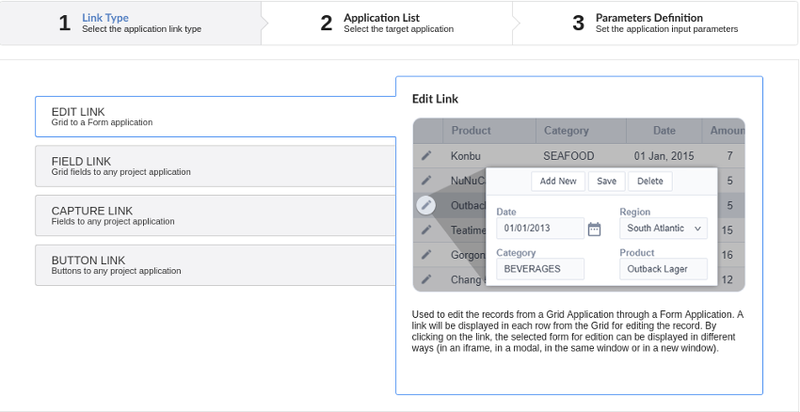 Allows to create a link through grids buttons to any application from the project.